If you've ever lived in an apartment, you can probably sympathize with me when I talk about how rough the kitchen situation can be. No counter space, never enough storage, tiny pantry, those coil stovetops.. I could go on and on. I can not wait to have a house with a real kitchen someday. I spend a lot of time in my kitchen, so even though there's nothing I can do about the horrible white laminate counter tops, and the old stove top with those dreaded coils, I have to make the most of the space that I have. The only way to keep my sanity and be able to actually get use out of my kitchen, is to keep it nice and organized. Disclaimer: It is not always organized, but this is how it should look. Lately I have been doing a weekend meal prep for the week. I grocery shop Saturday morning. If I'm really on top of things I order on Friday so I can just do grocery pickup on Saturday morning. So easy, and no temptation to buy anything extra! I save the actual prepping for Sunday morning. I wake up pretty early and spend a couple hours in the kitchen before Chris wakes up and I'm done for the week. This is also the day I clean the fridge, take out the trash, and empty/load the dishwasher. I was doing these tasks more often throughout the week, but with meal prepping, there's no need to anymore. Each night our dishes from the day go into the dishwasher, and I run it on Thursday or Friday. Just having this schedule keeps me pretty organized. 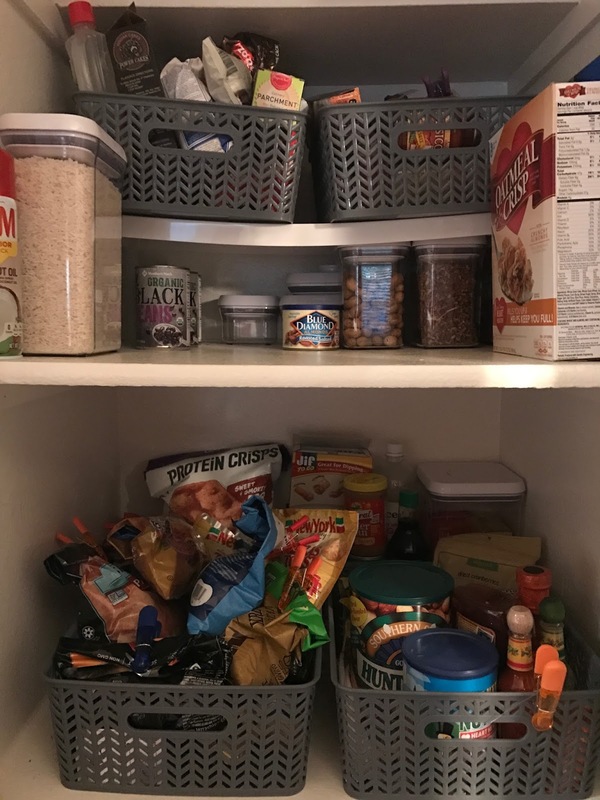 Probably the area where organization is most important is the pantry. I got these baskets at our local Five Below. They are great for keeping things organized. I have our things grouped in categories like chips, snacks, baking, and pasta. I probably need a metal shelf, as this plastic one is all warped, but it's still doing it's job. What this photo doesn't show, is the garbage can below, with a small shelf behind that stores trash bags, plastic baggies, extra napkins, etc. and also above, things like sugar and flour. 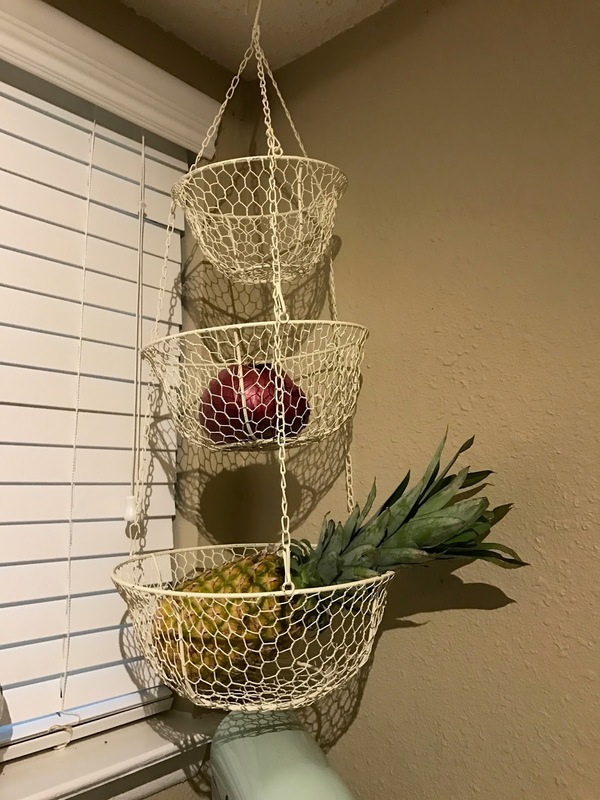 This hanging basket is another thing I love. Its the cutest little organization tool. Everything is off the counter and I just think it's super cute. I also love that it reminds me of what I have. If I put these things in the pantry or the drawers in our fridge I forget about them and they get wasted. This helps me remember to cut that fruit up for a nice snack. I don't have a particular way I organize my fridge, except that meat and water is always on the bottom. Usually most meal prep stuff is on the bottom and each night I move what we need to take the next morning to the top shelf so there's no searching for anything. 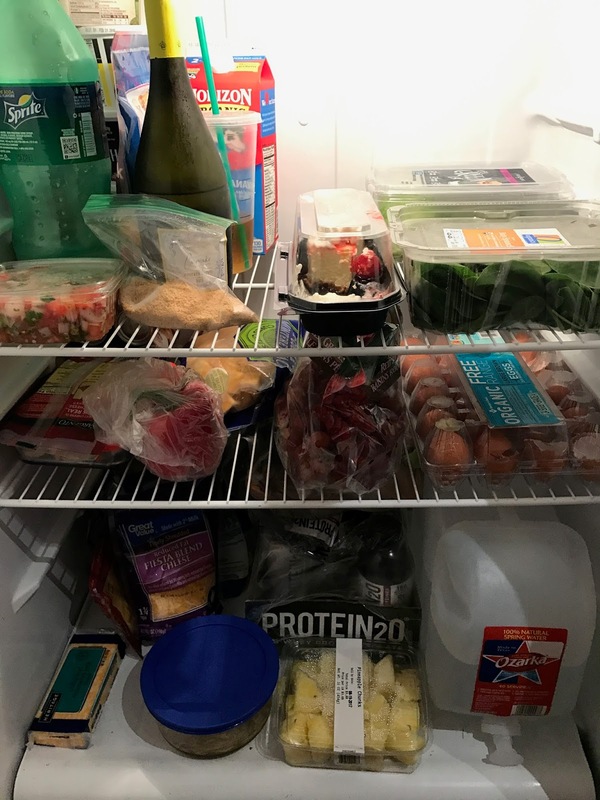 For me, going through my fridge once a week and getting rid of anything thats gone bad is enough to make it feel really organized. We don't keep a whole lot of extra food. This is on Sunday before meal prep was finished. I keep the cooking utensils I use most often on the counter in this pretty jar (from world market) right next to the stove so they're easy to grab, and I don't have to worry about an overflowing utensil drawer. Just doing these few little things make my tiny kitchen run much more smoothly. Even when it does get messy, I find that it takes less time to put back together because I already have all of this in place. Did you like any of these tips? What is your favorite kitchen organization hack? Let me know in the comments!